The effects of climate change are perceived differently. There are some changes that are immediate and some that are long term. These long-term effects are unperceived and as a result are hard to plan or design for. Since they are so far removed from our present, they impending dangers are deemed unimportant and it is difficult to gain support. It is these conditions that are harder to design for. Rising sea levels are one of these conditions. It is expected that sea levels have been rising at a rate of 1-2.5 mm/yr. 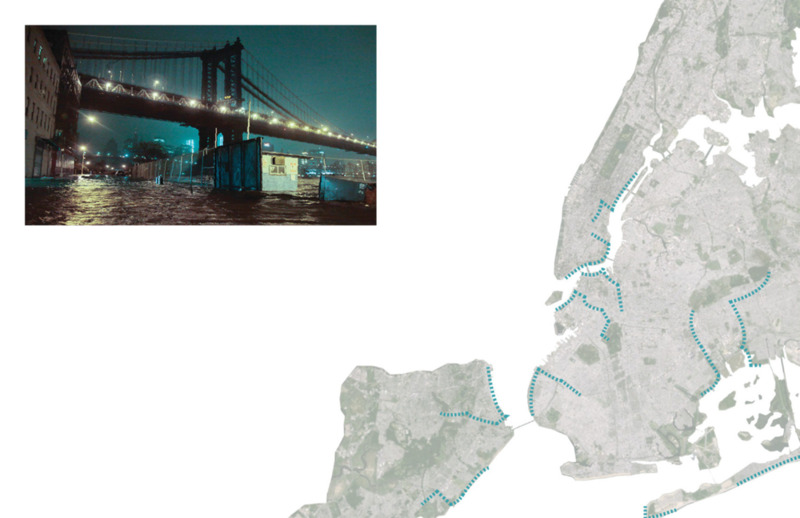 In New York City, the sea levels are projected to rise 2.73 mm/yr. These changes will only be truly felt in 100 years when sea levels would have risen by 8 feet. Even though these conditions are so far in the future, a super storm like Sandy functions as a window into the future, which allows us to begin to understand what our world, would look like. As sea levels rise, there will no longer be a clear distinction between what is water and what is our built environment. Sandy wiped out homes, transportation, and a majority of our power grid. In the future, with the rising sea levels, invading water that caused this destruction will be permanent. Quite literally water will exist in larger quantities where it was not expected nor planned for. Sea level rise would only intensify and worsen conditions created by super storms. Perhaps these interventions would not create enough of a change. Maybe these interventions cannot and should not be thought of as an amendment to our cities edge, but must be invited and injected into the urban fabric along with the rising tides. A system of controlled erosion should be implemented. It is a design intervention that would be implemented over time and as such would along with projected conditions.It would aid to redefine and re-imagine the current relationship between water and the city. In doing so, one could manipulate and plan how water invades our city. This new resource could provide us with the opportunity to re-imagine certain economies such as the manufacturing industry. This entity would compliment the long manufacturing history that existed in NYC since the early 1900s. In this instance, one entity would occupy the building and the functional spaces below. The public circulation would be controlled and pushed to the periphery. It is also possible that these systems would break down. These spaces would be rendered useless. These structures would be abandoned and ultimately left to decay. The water could breed disease and accumulate trash. This intervention would utilize two technologies: a tidal barrage and floating wetlands. The tidal barrage generates energy as water passes through a series of water turbines imbedded in the structure capitalizing the natural movements of the East River. The floating wetlands work to purify the toxic polluted waters of NYC.